Private-sector property developers act as owner/operators, leaseholders and financiers, and thus assume significant risk in the development of a property. Property development companies are involved in a wide variety of markets including commercial, industrial, residential, recreation and tourism. The strategic selection of land acquisitions is a critical factor for success. As a landowner, the property developer also assumes the responsibility of building and maintaining infrastructure within the project, in order to present the property as an attractive and profitable investment for potential lessees. Building the best quality infrastructure is not only a smart financial decision but a strategic one. In parallel, a large part of public sector responsibility lies in the provision of infrastructure, facilities and amenities for constituents. It is the public sector’s role to develop public assets that meet taxpayers’ needs, expectations of quality, and longevity. They are entrusted to protect public money from risk and spend it wisely. A development model known as P3 (Public-Private Partnerships) has emerged to allow for risks and rewards of building public infrastructure to be shared between private and public sector partners. P3 is a long-term, performance-based approach to procuring public infrastructure. The private sector partner, such as a property developer, assumes a major share of the risks in terms of financing and construction but is also held accountable for effective performance of the structure, including its design, planning and maintenance. A P3 contract then connects ongoing operations and/or maintenance payments over the life of the asset to the quality of the original construction based on specified performance criteria. In a P3 project, it is clearly in the property developer’s interest to build the most sustainable, high-performance and maintenance-free structure possible. As well, transportation infrastructure, including the construction and maintenance of roadways within the project, becomes part of the P3 project scope. A low total cost of ownership (TCO) of planned roadways, such as avoidance of frequent repairs and upgrades, is desirable. One of many advantages of P3 is the engagement of private sector expertise and the opportunity for the private sector contractor to introduce innovation. When it comes to innovation, Tough Cell is setting a new standard in the world of road building and civil engineering. Tough Cell, the most durable novel polymeric alloy (NPA) geocell available in the market today, is made from Neoloy, an innovative NPA material. Tough Cell offers unique solutions for ground improvement and soil reinforcement necessary for infrastructure development. Typical large-scale property developments require combined solutions across the entire project scope; Tough Cell delivers not only durable and maintenance-free paved and unpaved roads, but also solutions for paved pathways, parking lots, retaining walls and other landscaping. Low construction cost and reduced maintenance costs throughout the project lifecycle means initial and operational savings for property developers as well as consistent performance earnings. Minimal environmental impact before and after installation. Reduced need for imported materials such as aggregate, asphalt and concrete means less motorized equipment, fuel and ultimately lower carbon emissions. Tough Cell can assist in green property development and achievement of LEED status. Tough Cell increases the bearing capacity of existing subgrades by increasing the modulus of infill materials, enabling construction even over poor soil. 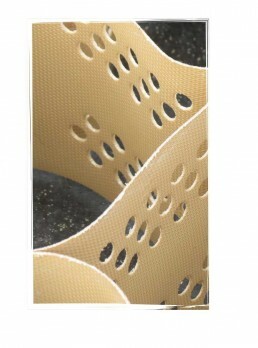 Withstands extreme temperatures and prevents soil erosion with its unique cellular confinement system. Tough Cell can be installed quickly in any conditions, year round, keeping your build timeline on schedule.